This bread is the perfect mix of sweet and tart! 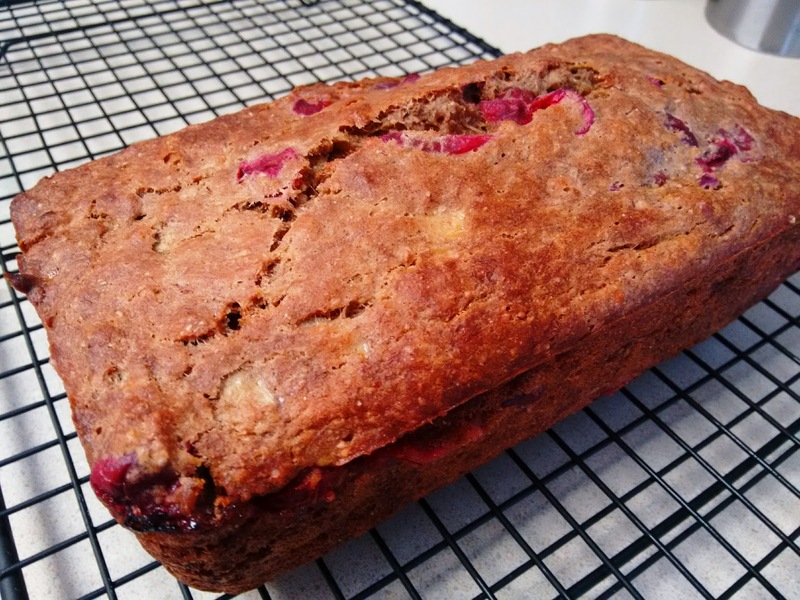 Fresh or frozen cranberries cut the sweetness of a typical banana bread. Cranberries are high in fibre (5.1g per cup), vitamins C and K, and manganese. They are in season from September to December, but frozen cranberries can be purchased year round. In a small saucepan, combine cranberries, water and honey. Bring to a boil, over medium heat, stirring frequently. Cranberries will split when cooked, after approximately 4 minutes. Set cranberries aside to cool. In a large mixing bowl, combine flour, salt, baking soda, and cinnamon and stir together. In a small bowl, mash bananas and coconut oil together. Add bananas to dry ingredients. Add vanilla extract, egg and milk and stir. Fold in cranberries. Pour batter into greased loaf pan and bake for 40 to 45 minutes, until a toothpick comes out clean. Allow to set in pan for 10 minutes, then transfer to cooling rack.